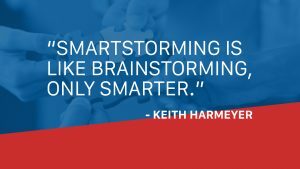 Now, as a Founding Partner of SmartStorming and co-author of SmartStorming: The Game-Changing Process for Generating Bigger, Better Ideas, Keith is providing other organizations with the expertise, structure, skills, and proven idea generation techniques they need to develop their own ground-breaking ideas and innovate. Click here to listen to the entire episode. If you want to learn more creativity and innovation, please visit my website and explore the ways I can help you and your organization grow through the power of improvisation.